CCAC Releases 2016 Native American Dollar Candidate DesignsThe Citizens Coinage Advisory Commission (CCAC) has released the following candidate design images for the 2016 Native American dollar coin. 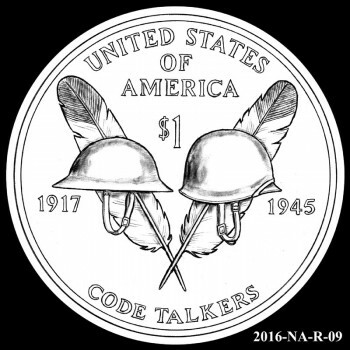 The 2016 Native American dollar reverse will recognize the heroic contributions of the Native American Code Talkers of World Wars I & II. Native American Code Talkers from more than thirty tribes served with distinction and played an important role in concealing the nature of secret communiques between American forces. I'd probably go with one of the more abstract ones: 1, 2, 3, 6, or 9. With a slight preference for 6. The others seem a little too specific and busy, although 10, 11, and 16 are okay. By Les PetersAfter the authorizing legislation for the dollar (Public Law 110-82) was read by April Stafford from the Mint, the 18 designs were culled by Chairman Marks, leaving designs 1, 2, 3, 4, 6, 9, 13, 16, and 17. The preferences of the stakeholders were designs 1 and 2 (Congressional Native American Caucus of the House of Representatives), 3 (Congressional Native American Caucus of the House of Representatives and the Senate Committee on Indian Affairs), 4 (National Congress of the American Indian), 9 (National Congress of the American Indian and the Senate Committee on Indian Affairs), 16 (Senate Committee on Indian Affairs).The committee favorites were 9 with 19 votes and 6 with 14 points. Design 9 received the committee's recommendation. For more on the subject, see 2014 Dollar to Honor Lewis and Clark and 2013 Sacagawea Dollar Reverse Unveiled.